Pete has released v1.6.15 of this brilliant free utility. The Release Notes for PT Prefs Helper say that in this version he has removed the Eucon preference trashing for now. He had followed the Avid guidelines for deleting Eucon prefs but have had two reports of it breaking the S6 Eucon control app. PT Session is the first of two new applications from Pete, and unlike PT Prefs Helper which is Mac OSX only PT Session is available for both Mac and Windows. PG PT Session is a utility initially designed to simplify making music lists. It can open a Pro Tools session text export file and you can then select which tracks to re-export. It then does this in a simplified format - no channel number (with a multi-channel track it just takes the left channel), no event number, removes fade in/fade out/cross fade can optionally ignore muted clips. It can also, on export, optionally merge all the tracks that have been selected into one merge track - useful if you need to just have a list of clips that occur across multiple tracks. PT WAV Checker is the latest addition to the Pete Gates stable of useful Pro Tools related utility apps and is also available for both Mac and Windows. WAV Checker is a utility that scans WAV files and verifies their structure. Pete tells us that it hasn’t been battle hardened by other people yet so don’t panic if it flags a file that plays fine (or crashes this software!). If you have a ‘false positive' Pete asks if you would send him a copy of the file (if you are permitted to do so) and he will investigate. If it crashes, also please let him know what you were doing and he will dig into it. 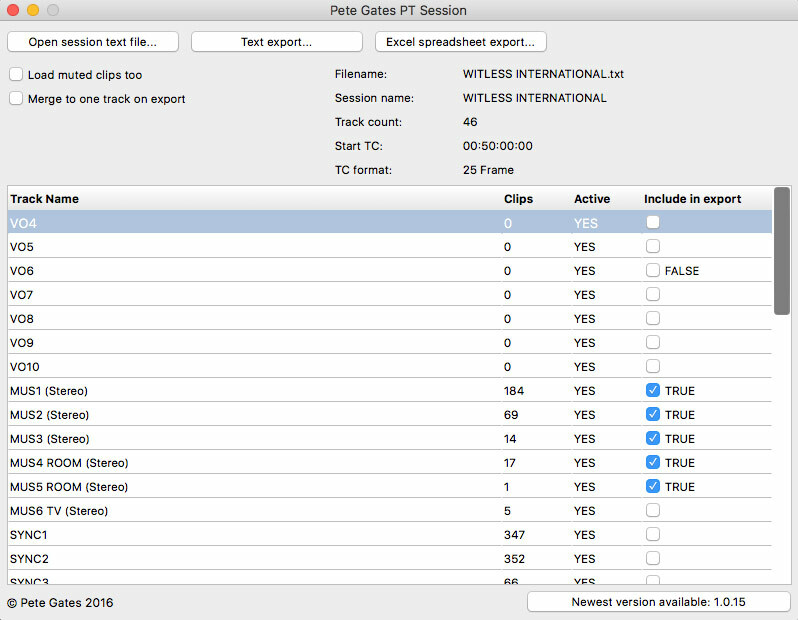 We love what Pete is going for the Pro Tools community. Like a number of developers his day job is as a dubbing mixer and supervising sound editor and has chosen to create some apps in his spare time to solve problems that we all have.